The Category 3 storm was centered about 100 miles north of the Dominican Republic Thursday afternoon and moving northwest at 9 mph. Heavy rain, high winds, and raging seas were lashing the northern coast of the Caribbean nation still cleaning up from Irma’s wrath. The footprint of destruction from Maria is likely many times worse in Puerto Rico and Dominica, when the hurricane was a Category 5 storm with winds over 170 mph. Hurricane Maria did weaken some after it passed over the mountains of Puerto Rico, and its wind field nearly doubled in geographic size, which typically happens when a cyclone weaken or fluctuates in intensity. Maria also developed an incredibly large eye that was found by a Hurricane Hunter aircraft to be 40 miles wide early Thursday. The center of circulation is currently moving over cooler waters left behind from Hurricane Irma, but re-strengthening is anticipated once it moves north of Irma’s path. In 48 hours, Maria will be moving into less favorable atmospheric and oceanic conditions for tropical cyclones. Wind shear (faster winds aloft) will overspread the region and the storm will be moving into an area of cooler sea surface temperatures. 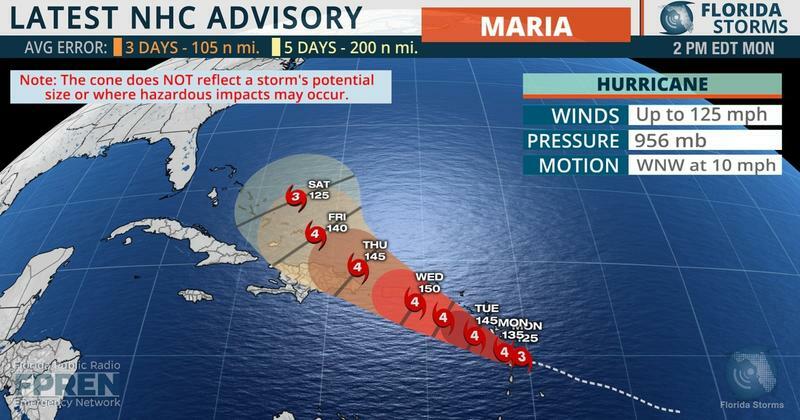 Maria is forecast to follow the edge of the subtropical ridge over the west-central Atlantic and turn north away from Florida and the southeastern U.S. The simple (non-technical) explanation is that Jose is lost at sea and waiting to be picked up by Maria. The more scientific prognosis suggests that Jose’s sluggish departure from New England will prevent the westerly steering currents from regaining control of the overall steering pattern in the western Atlantic. It was these strong winds aloft on the south side of a large high pressure system that drove Hurricane Irma into Florida on September 11. Now that Jose has lowered the pressures north of Maria, the cyclone will have no trouble moving poleward and stay far away from the East Coast. 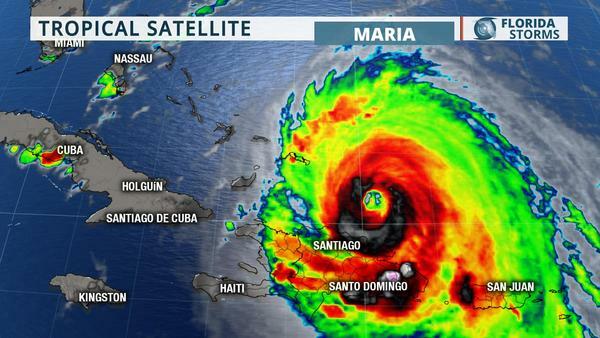 Despite Maria’s projected distance from Florida, large ocean swells are expected to reach the coastline by late Friday. This will enhance the already high risk for rip currents and could cause minor coastal flooding in some spots over the weekend, especially at times of high tide.